Prospective customers are looking for what you offer. You have a base website with your credentials and general page content a gallery, your availability calendar and so forth. The pages aren’t going to change all that often in any grand scheme, whilst you can add new content to them, the overall purpose of those pages won’t change. This used to be fine, however now that the search engines are looking to offer their users the best of the bests. It’s no longer just a set and forget process. Whilst it may seem like a complex process, what you need to understand here, is that things have change dramatically for websites and website technology. There’s a whole process now, to what you need to have on your website in order for it to be seen as legitimate – most people base the authenticity of a business as to whether they have an active social media page – because “EVERYONE” is on Social Media… – A Stereotypical response – yes… but it’s how it is… And through the diversity of creating additional resources for the search to explore, this helps to keep your business on top of the search engines. Whether we like it or not… we either have to take the leap and implement new measures in order to stay current or get left behind.. and whilst you may be apprehensive at this stage, you never know, you may find that this becomes something you enjoy. A creative outlet. A blog on your website allows for content creation. By producing content ON your own website, you’re creating more of an authority.. Each blog post has it’s own link, which means there are more “pages” online for people to explore.. The more times people are going to your website to view things and exploring the more you’ll see positive interaction on your search engine rankings…. When Google sees that your website is getting more interaction it will move it up the ranks. A focus keyword or phrase relevant to the article. And from here we hit publish and that post is visible on your website. You can go through and write a heap of posts ahead of time and set the publish date at a later date – this will mean it won’t be released until the publish date.. So you can plan ahead and create content ahead of time. Once you have your content – it’s time to distribute it. 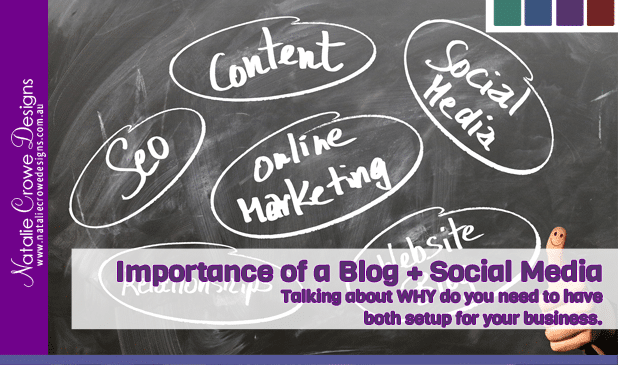 With your blog post written, You then talk about the post on your social media platforms.. aiming to encourage the users to take action on your site ( I discuss this further down)- Like it, Share it, Sign up for an email List, Contact You or Make a booking etc…. YES it’s going to take some planning, but I can guarantee you, you will see a lot more interaction with your business simply by visible to your prospective customers. Sharing your content with their networks to build your reputation and presence. Obtain their marketing information – for example their email -getting them signing them up for a newsletter so that you CAN market to them directly to their inbox. To develop rapport with your audience. These are just some of the targets most businesses would consider. Whilst it all seems overwhelming with all this information to consume, it’s truly something you CAN master.. .you can utilise and you can truly benefit from it.. You’re already updating Facebook, it’ll be just a case of writing a little more information for a blog post and then incorporating that into your Facebook posting schedule – which there are plenty of ways we could improve this process as well. If you’d like some assistance getting this process under control please make an enquiry via our contact page.